"Steve, there are riots happening right outside your hotel!" my only contact in Jakarta, Indonesia told me over the phone. "All our meetings are off! Whatever you do, don't leave your hotel room!" Then he hung up. I looked out my hotel room window... and couldn't believe what I saw. I saw fire. Young people throwing and breaking stuff. I saw anger. And frustration. Like I've never seen in my life. It was 1998. I had just landed in Jakarta a few hours earlier... during the final days of the 31-year rule of President Suharto. The Indonesian rupiah had lost 80% of its value in the past year. The stock market was down more than 90% in U.S. dollar terms. The rumor was that only 22 of the hundreds of companies trading on the Indonesia Stock Exchange were solvent. A day or two later, when the riots dissipated and things calmed down a bit, I had a meeting with the head of Indonesia's central bank. I asked him what his plan was to stop his currency from falling. He replied, "Got any ideas?" He was only half joking. Indonesia was falling apart. This isn't just an Indonesia story, as you are well aware. History is littered with examples of how leadership with no term limits has turned out badly – and how the countries involved have ended up worse off. Hugo Chavez eliminated term limits in Venezuela in 2009. Vladimir Putin circumvented the existing term limits in Russia – he has now entered his fourth term. And, as I'm sure you've heard, the Communist Party recently eliminated term limits in China. That's right... We now have a potential "president for life" in China. This is a big change. And it's important to think about what it means for Chinese investments. In the bigger picture, a big danger of the "president for life" approach is the potential for policy mistakes to go unchecked. In other countries, we've seen leaders start out reform-minded. But under the golden halo of absolute power, they became an autocratic "bad emperor." So far, there have been few major policy blunders in China. But the imposition of unchecked, unlimited power increases the risks of such errors over time. Peter is exactly right. It's a genuine concern for the political and economic system in China. It could go badly... eventually. But what does it mean for investors today? I've been a major China bull over the past few years. I even launched a China newsletter to capitalize on the once-in-a-lifetime opportunities that are taking place there now. Still, those opportunities have a shelf life. I don't expect to be "all in" on China forever. And while the lesson of history is that "president for life" is not a good thing in the very long run... you can make a lot of money in China without being around for the long run. In the short run, this could be hugely beneficial for Chinese stocks. Stock markets hate uncertainty. And over the next few years I expect to be investing in China, it appears we will have certainty there. President Xi Jinping will be in power, period. So no, I'm not a convert to "president for life." But we still have a great window of opportunity in China. Stocks are still reasonably priced, and outside investors have not bought in yet. We should have a reasonable period of certainty in the markets. These are good things. And they point to major opportunity in China right now. I've said it many times: I expect hundreds of billions of dollars will flow into Chinese stocks over the next few years. If you haven't already... get your money there first. For example, look at Callaway Golf (ELY). The $1.6 billion company is the largest manufacturer of golf clubs in the world... And it's the No. 1 club brand in the U.S. 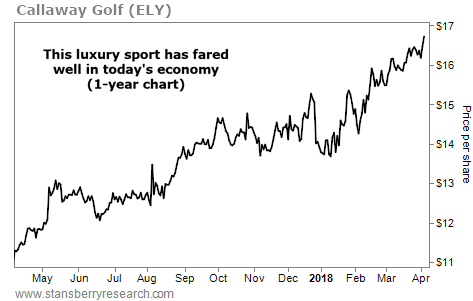 Following the 2008 recession, participation in the golf industry dropped off. But things have turned around in today's bull market. Callaway's net sales increased 20% in 2017. And its outlook for this year is positive as the industry continues to strengthen.